Do you know that your newborn will sleep for about sixteen hours each day? That being said, you will need to provide a safe and comfortable place where the little one will sleep. In today’s market, bassinet options is quite extensive. Some people may think buying the most expensive one is the best option but soon enough you will end up scratching your head and wondering about other bassinets on the market. It is important to do your research, read reviews and find the best bassinet for your family needs. We’ve rounded up some of the best-rated bassinets and price is one of the determinant factors in best rated to help you make the right choice! We know as new parents, budget friendly is always on our minds. Now let’s dive in. 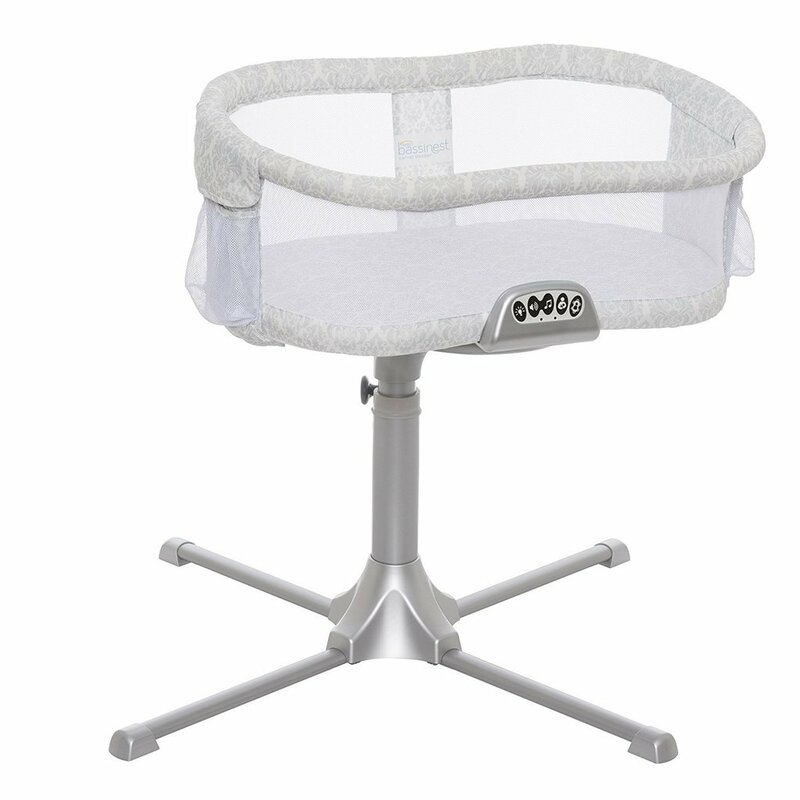 The HALO Bassinest Premiere Series bassinet is one of a kind. It is the only one on the market that is able to rotate 360 degrees for the ultimate convenience and safety. The frame is sturdy and has a stable 4-point base height adjusts to fit next to your bed and has breathable mesh walls for easy viewing. Halo also included a nightlight and module with three lullabies, three nature and womb sounds and two levels of vibration and nursing timer with auto shut off. This bassinet is unlike any other available on the market as it offers you the ability to swivel it around at full 360 degrees, so that your little one can be provided for in the way that’s most comfortable and safe for both parents and child. You can always sleep as close to your baby as possible without the need to share your bed with them which is not recommended by baby care professionals in the first place. As you rotate the bassinet, it is easy to get in and out of without the need to remove the bassinet. Also the side wall can be tilted towards you to make it even easier to tend to your baby. It is one of the best-rated bassinets on the market, and quite deservedly so. It goes without saying that the base height can be adjusted and its legs can be tucked neatly under the bed. On top of all this, it also features a small module which you can use to play melodies, nature sounds, and womb sounds and it can reproduce two levels of vibration, accompanied by calming nightlight. Sure, it is quite pricey, but even at first glance it looks like something that came out of a sci-fi movie. This is what happens when you take a product like a bassinet and aspire to utter perfection. It is also ideal for small spaces. The Halo Bassinest Premiere Series bassinet is our favorite bassinet. Splurge on this bassinet and you will not regret it. A Winner! 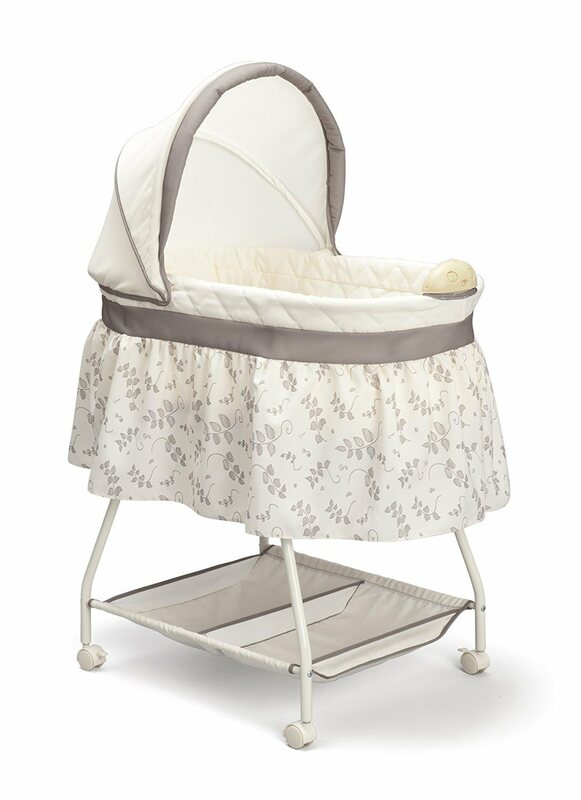 The Sweet Beginnings bassinet is beautiful lightweight and classic. Only 10.5 pounds. It has a sleek design with casters with locks which makes moving it easy from room to room. This model has a neutral foliage design, a perfect look that can be used for both boys and girls. It comes with a comfortable sleeping area with fitted sheet. Delta also included many wonderful features in this bassinet. An adjustable/removable canopy and two section storage underneath for your baby’s essentials. A nightlight and a music module that plays pre-loaded lullabies. It has a weight capacity of 15 pounds. The Sweet Beginnings bassinet is meant for babies who weigh no more than 15 pounds and it features a lovely and gently falling leaves pattern, combined with dark gray accents. The bassinet also comes with an adjustable canopy which can be removed if need be. We appreciate the very convenient feature of small wheels so it can be easily moved from room to room and safety option lock the wheels too. The large basket with two separate compartments comes in handy. It helps keep all your baby essentials within arm’s reach. The sleeping area is very cozy and comfortable as it consists of a polyester fiber pad, a padded mattress and a fitted sheet. The small music module which can play several soothing melodies so that your baby can fall asleep easier is a great bonus. The nightlight included for additional calming effect is also helpful. We really like the Falling Leaves pattern on this bassinet model but there are other designs available, all of them light-colored and on the calming side of things if you want a different look. 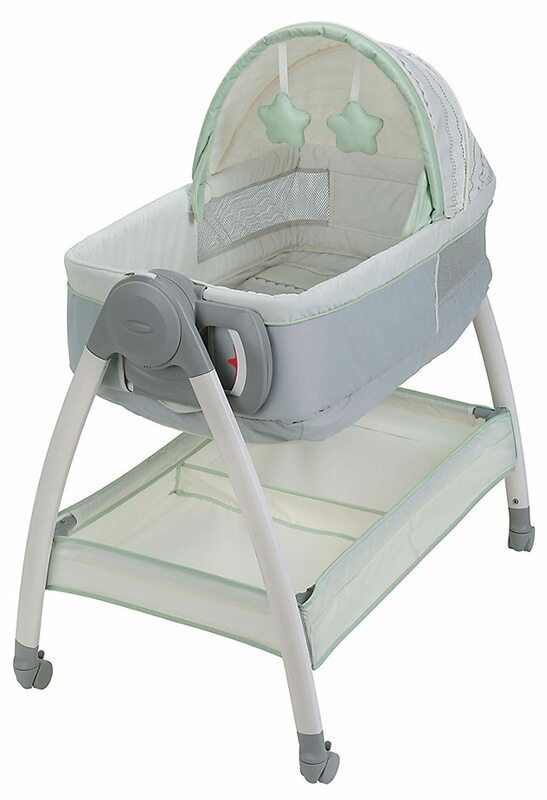 Overall, the Sweet Beginnings bassinet is a wonderful, compact and a great deal. block light with an adjustable canopy. It features a easy wipe clean fabric, wheels for moving and large storage for baby essentials. The Dream Suite bassinet is a one of a kind. A reversible bassinet and changer all-in-one is changeable at a touch of a button is clever. This Graco bassinet can handle babies up to 30 pounds, so you may be able to use it much longer than many bassinets on the market. We also like the fact that it can produce two vibration speeds for your baby to fall asleep much easier. The wheels make it easy to move the bassinet around the house and can be locked for safety. The canopy can be adjusted or removed altogether is also a great feature. We love that it comes with a machine washable mattress cover. The two soft toys hanging from the canopy adds a sweet little touch too. We admire the fact that the Graco comes in 2 different designs and color patterns for boys and for girls which isn’t always the case with bassinets. The Graco Dream Suite bassinet is wonderful for your baby. Also, if you have limited space - it is a nice option. These are the Top 3 best rated bassinets on the market right now. If we really had to choose one as the winner, it would be the magnificently designed HALO Bassinest Premiere Series because it offers virtually limitless setup options and is jam-packed with features. But if you are looking for a budget friendly option, we strongly recommend going for the Graco Dream Suite bassinet. Your little one will thank you as it sleeps soundly in the bassinet you choose.